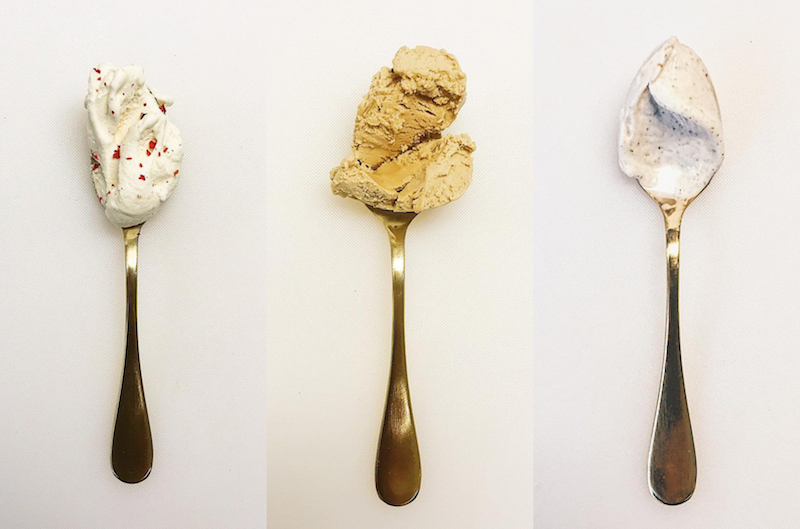 Don't be vanilla in your choices - when it comes to ice cream, that is. (Although the same could be said of life.) 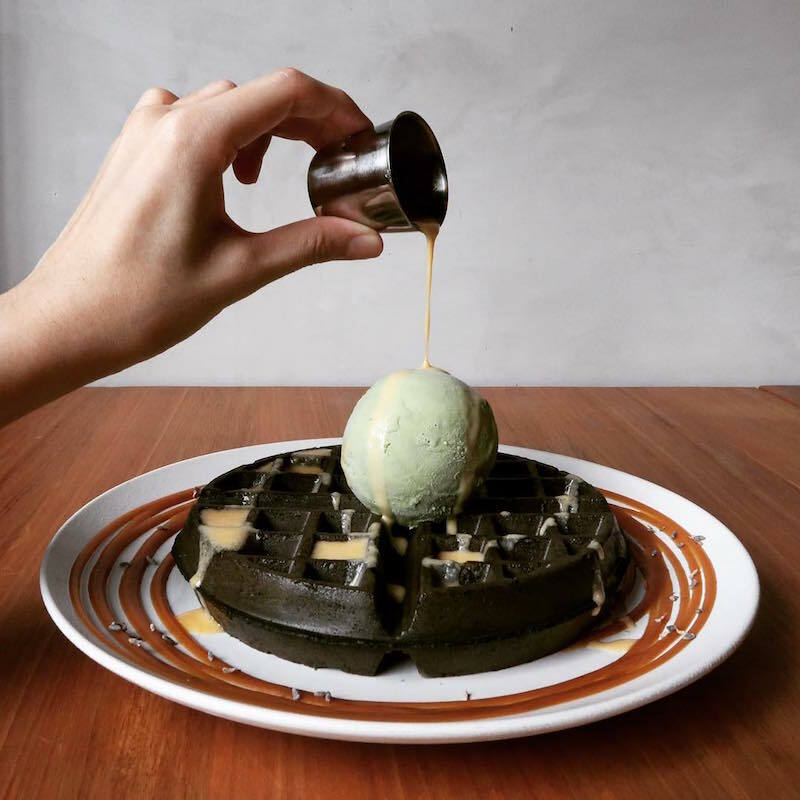 With dessert cafes aplenty in Singapore, we've got quite the assortment of unique ice cream/gelato/sorbet choices, from chrysanthemum and kimchi to nasi lemak and pulut hitam - even alcoholic renditions get creative with craft beer IPA and watermelon soju. So there's really no reason to stick with conventional choices of chocolate or strawberry each and every time. Weird and wonderful twists await. 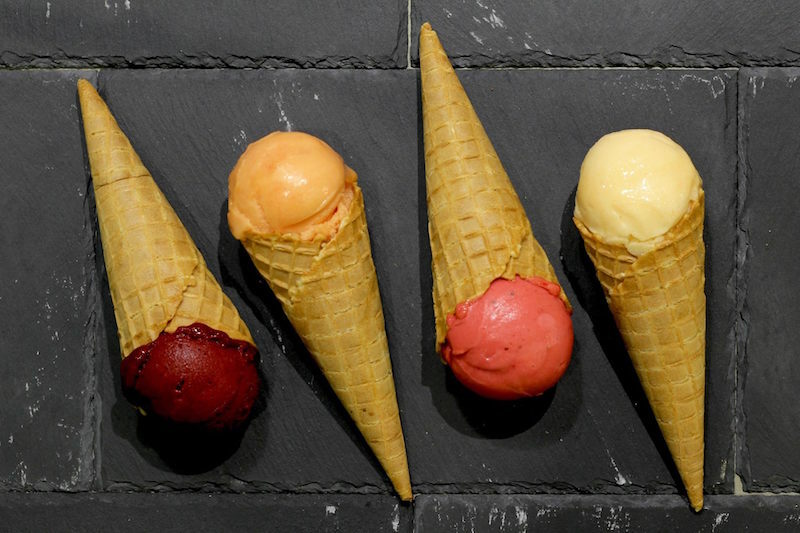 Here's the inside scoop on 13 ice cream parlours where you can get the frozen treat in unusual or exotic flavours - keep 'em in mind the next time you're melting under the tropical heat. 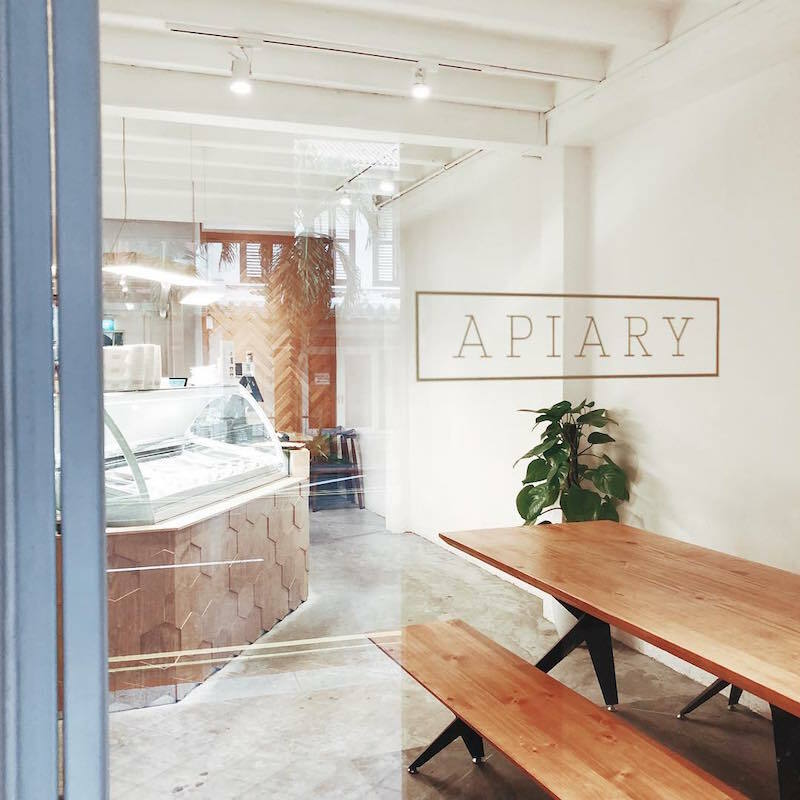 Hidden along the Neil Road stretch, Apiary sets the tone for its made-from-scratch small batch ice creams with its cafe's warm and welcoming feel. 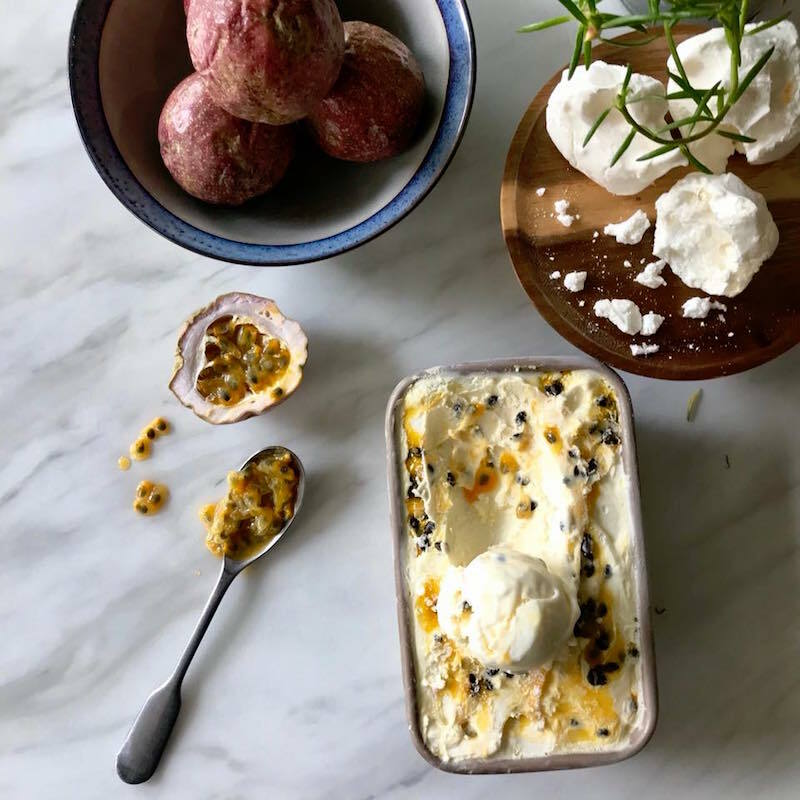 It's named after the place where bees are kept (cute) - and this sweet spot strives for natural and fresh ingredients, without the addition of artificial flavours and colourings. Buzzworthy flavours - which may or may not always be on offer when you visit - include blue milk (tinged with blue pea flower and a dash of sea salt), pink peppercorn, cold brew coffee, and Sicilian pistachio. You can choose to get your scoop in a cup or cone, or go for broke with the brownie, waffle, or brioche bun pairing. 84 Neil Rd, 6493-7273. Sun-Thurs noon-10pm, Fri-Sat noon-11pm. From $3.90/scoop. Delicate on flavours, the range of botanical-inspired gelato by Birds of Paradise is an intricate creation made with herbs, spices, fruits, and flowers. They're creamy and light, refreshing with subtle undertones, and come in intriguing blends such as lemongrass ginger, white chrysanthemum, spiced pear, vanilla fig swirl, and strawberry basil, which you can get in a fragrant thyme-infused cone for an extra $1. 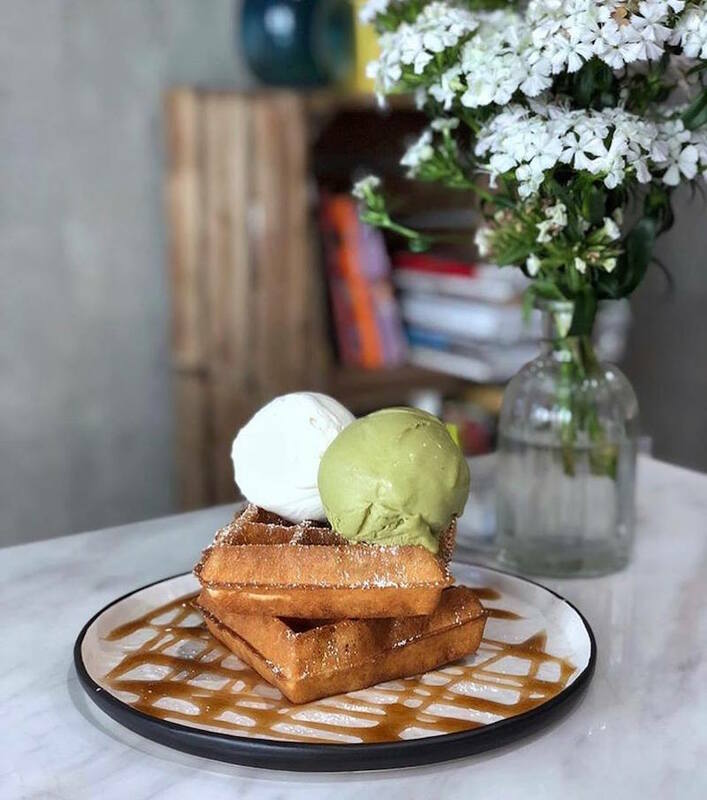 Just as lovely is the ice cream parlour's shop space, a photogenic pastel paradise nestled in the midst of the food-centric neighborhood of Katong that's as charming as it is cosy. #01-05, 63 East Coast Rd, 9678-6092. Tues-Thurs & Sun noon-10pm, Fri-Sat noon-10:30pm. From $4.70/scoop. Always on the hunt for new, mind-boggling tastes, the modest River Valley cafe - with its tiny dine-in space, industrial look, and coffee-themed wall illustrations - continually alternates its house-made gelatos that are smooth and richly satisfying. 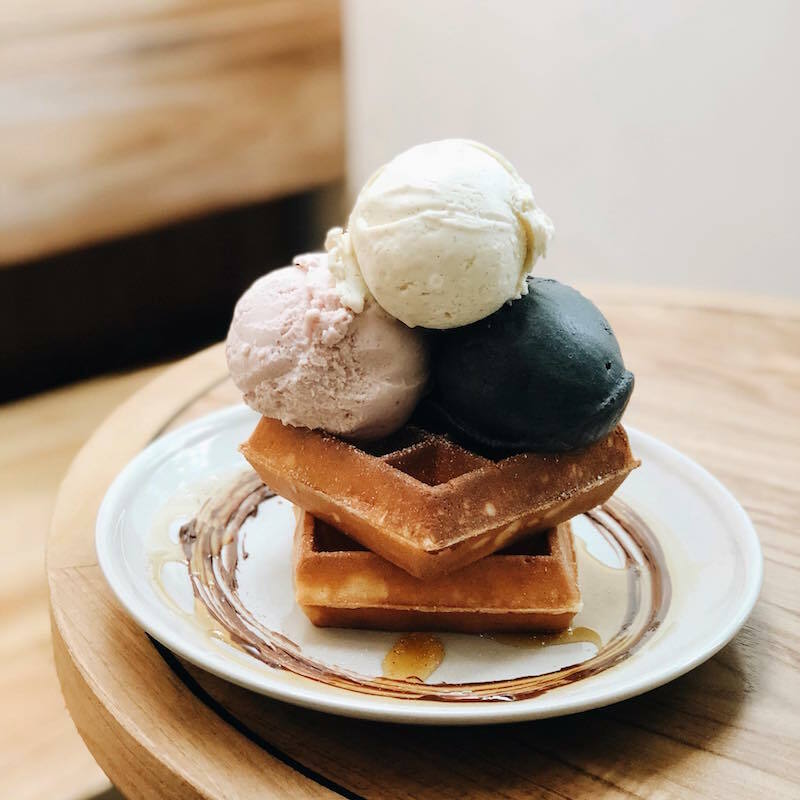 Think out-of-the-ordinary concepts like kaya toast, brown butter pecan, mango lassi, masala chai, strawberry basil, miso caramel, and root beer float. Vegans can also have their sweets and eat 'em too, with the dairy-free, nut-free, egg-free, and gluten-free range of balsamic strawberry, cardamom coffee, hojicha, and virgin lemon mojito gelato and sorbets. 238 River Valley Rd, 6734-7855. Tues-Thurs noon-9pm, Fri-Sat noon-10:30pm, Sun 2pm-9pm. From $5/scoop. 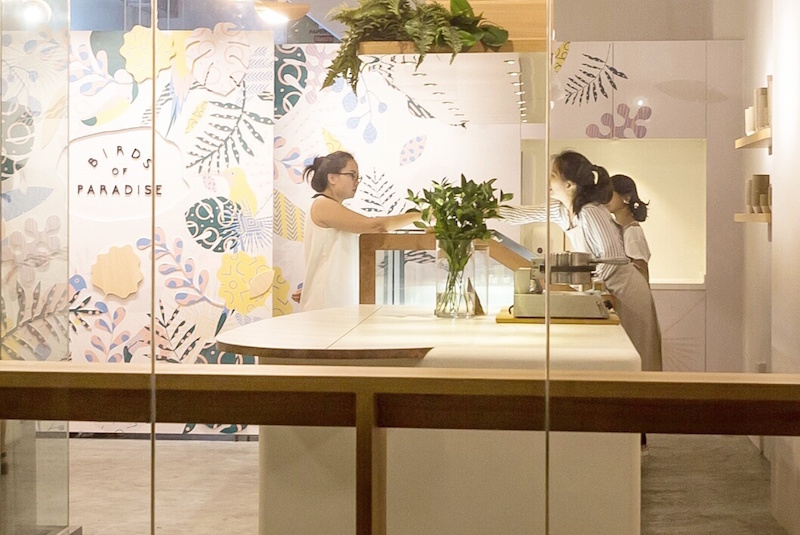 Adorable name (and logo) aside, this Taiwanese-owned eatery whips up waffles, crepes, and coffee in its open-concept space that makes you feel right at home with its rustic trimmings, brick walls, shelves of dining ware, and kitchen island. Which makes sense, given it's situated in a heartland area. 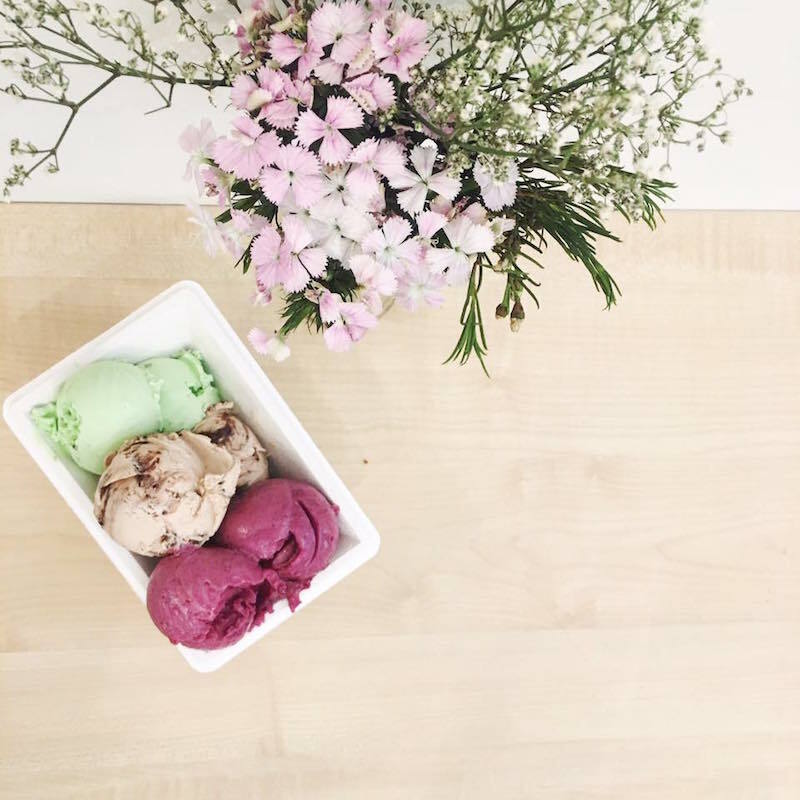 Tucked away in the gelato display, fascinating flavours like extra virgin olive oil and blackcurrant, mont blanc chestnut, passion fruit meringue, and craft beer IPA have been spotted - all the more reason to make a trip out to Serangoon if you don't typically frequent the neighborhood. #01-378, Blk 326 Serangoon Ave 3. Mon-Thurs noon-10pm, Fri noon-11pm, Sat 9am-11pm, Sun 9am-10pm. From $3.50/scoop. 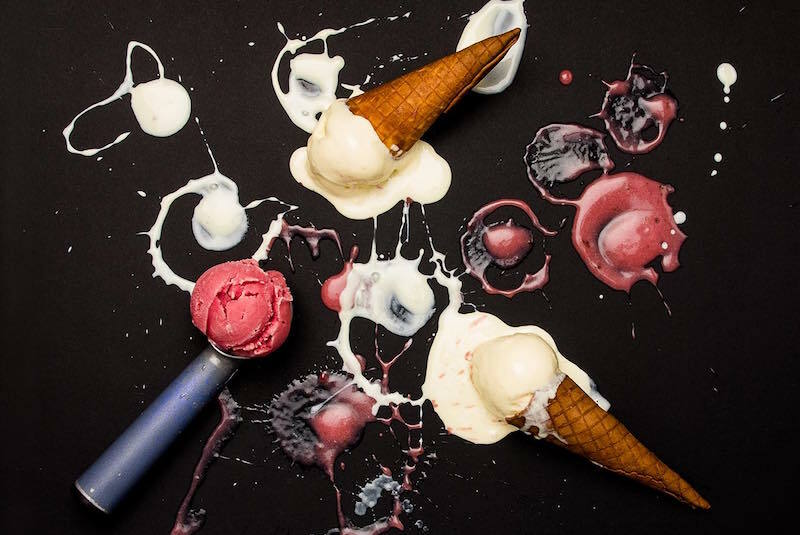 This Bangkok brand, which has expanded to Malaysia and Singapore in the years since its debut in 2012, attracts sweet tooths to its casual shop space with the draw of molten lava cookies that gush goo when you drop a scoop of ice cream on 'em. 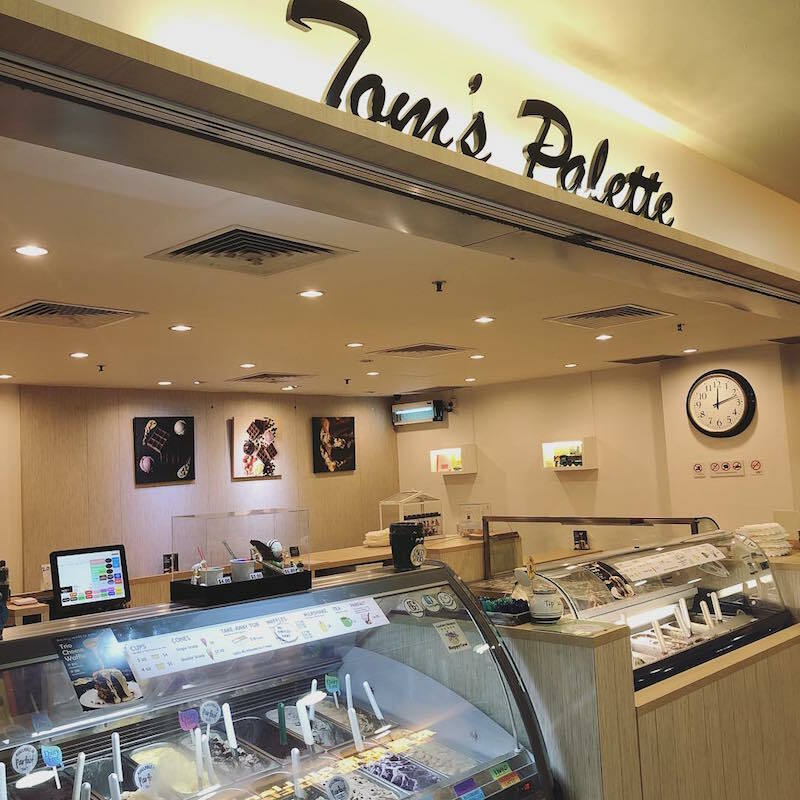 With about 60 options on rotation in the display case of 12, the ice cream blends come in innovative creations like Banoffee, Black Dog (made with Guinness stout), and Strawbeery (a mix of strawberry and beer), which you can get with red velvet cream cheese, matcha, salted egg, and chocolate lava cookies. Or chili crab molten cookies, if you make it in time for its National Day 2018 menu. #01-03, 139 Tyrwhitt Rd, 8133-1250. Mon-Wed 12:30pm-10pm, Fri 12:30pm-10:30pm, Sat noon-10:30pm, Sun noon-10pm. From $3.80/scoop; $7.90-$8.90 for lava cookie set. 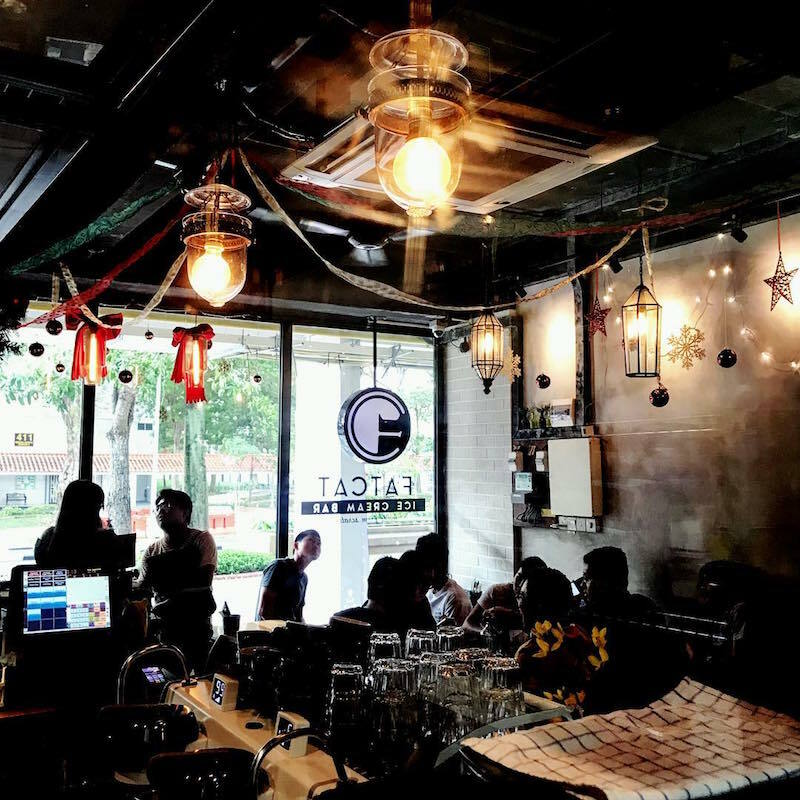 Originally a humble heartland spot at Toa Payoh in 2011, Creamier has now extended its reach to Tiong Bahru and Gillman Barracks. And rightly so, 'cause the cafe seems to be perennially packed - even late at night. 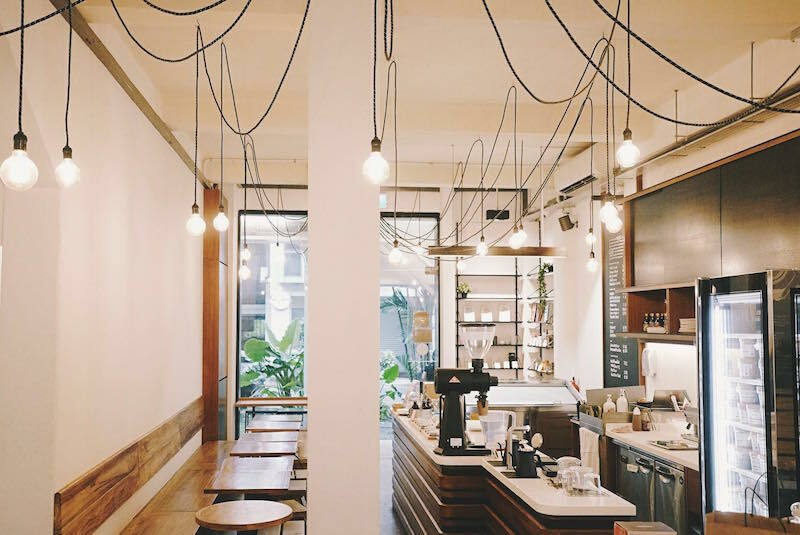 Upon entering, you're greeted by the buttery scent of waffles and the sight of curious dessert enthusiasts poring over the 12 ever-changing concoctions on the line-up. Think pulut hitam (black glutinous rice), acai banana sorbet, peanut butter jelly, black forest, Thai milk tea, and black charcoal sesame. If you're new to the Creamier experience, we'd recommend a double scoop atop thick, fluffy waffles. Three locations, including #01-18, 78 Yong Siak St, 6221-1076. Tues-Thurs noon-10pm, Fri noon-11pm, Sat 11am-11pm, Sun 11am-10pm. From $3.80/scoop. Taking a playful approach to crafting its ice cream from scratch with natural ingredients, Fatcat is quite the fan favourite with flavours like butter beer (yes, that Harry Potter wizarding beverage), white peach sangria, smoked chocolate, popcorn caramel, champagne rose, barley tea, and watermelon soju. Get 'em with brown butter or charcoal waffles, or sink your teeth into experimental desserts such as lime mojito spheres and Reverse S'mores, which consist of banana caramel sorbet and torched marshmallows on a cookie base. #01-25, Blk 416 Bedok North Ave 2, 6241-0830. Mon, Wed-Thurs 1pm-10pm, Fri 1pm-11pm, Sat noon-11pm, Sun noon-10pm. From $4.50/scoop. Serving up locally-inspired flavours for more than a decade, Island Creamery rejects artificial colors, flavourings, and preservatives to whip up creamy concoctions of teh tarik, pineapple tart, pulut hitam, pear sake, soursop, Kahlua latte, chendol, bandung, ice kachang, and Horlicks. 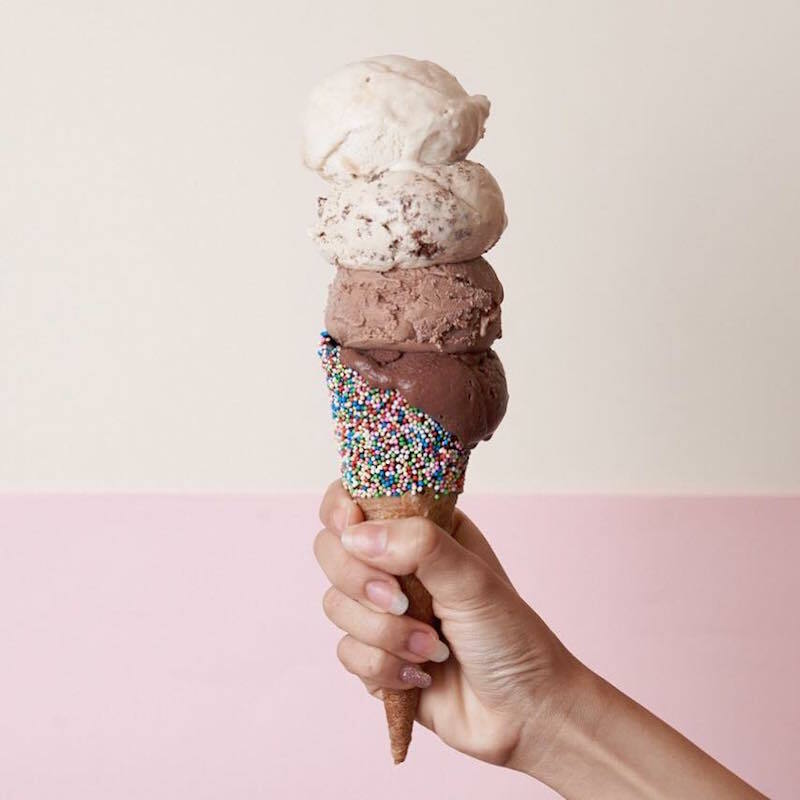 You can order a scoop or two with waffles, or pair your frozen treat with other desserts like mud pie, baked Alaska, and ice cream cake for a calorie party. Three locations, including B3-K1 Ion Orchard, 6509-5098. Daily 10am-10pm. From $3.80/scoop. 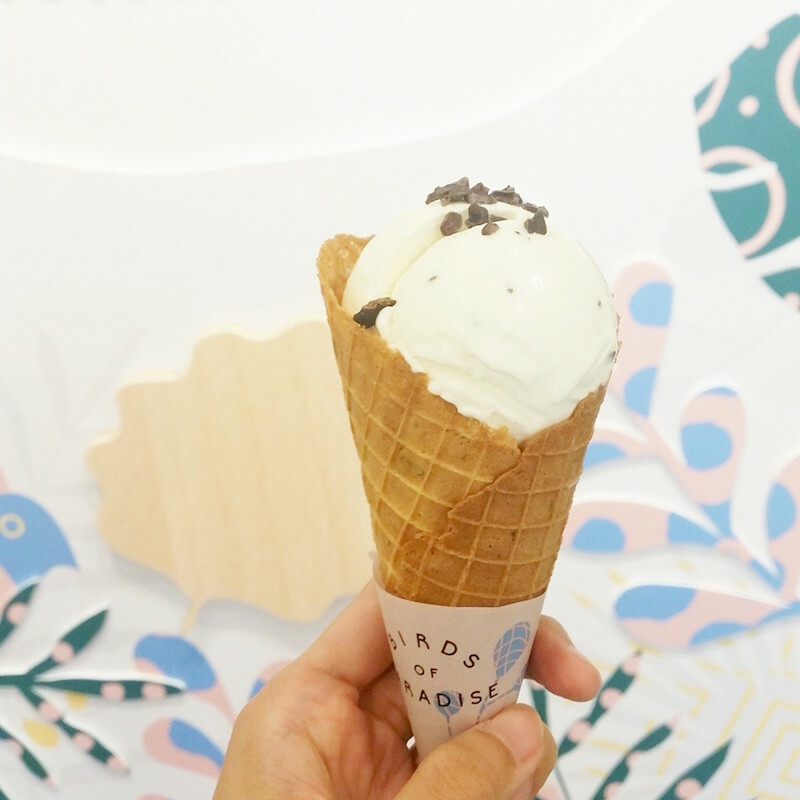 Debuting about two years ago at Serangoon with its signature lava cookie and ice cream combination, Kooks Creamery has faithfully kept its original concept even with its new outlet at The Cathay. No surprise, seeing as how people love to watch desserts ooze. Uncommon flavours here include Ferrero Rocher, brown butter, nougat, milk cereal, and black sesame, which you can plop on a cookie that's fresh from the oven, and scoop up the gooey core as it swirls all over the plate. Two locations, including #01-06 The Cathay (near Dhoby Ghaut), 9006-8748. Daily noon-10pm. From $3.60/scoop. 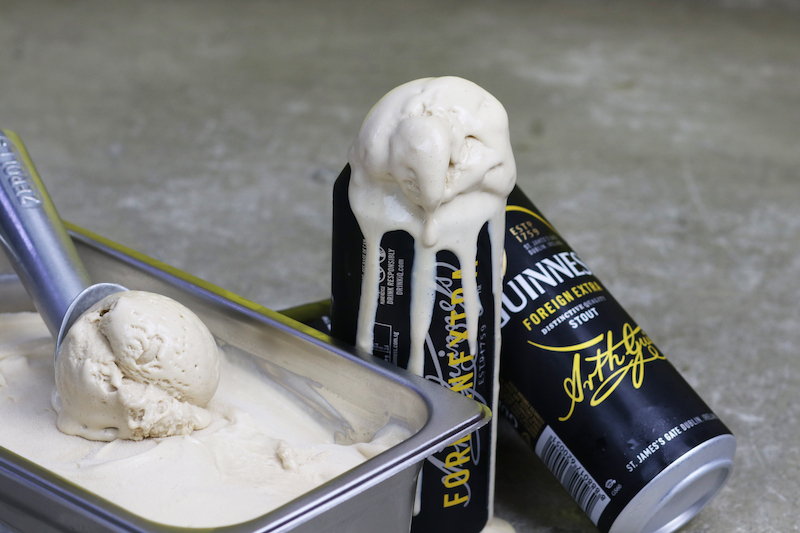 Unlike what its name suggests, this tiny joint isn't merely about ice cream - it's about damn good pints that never fail to bring in the parched crowds. On the evolving roster of quirky options, you can pick your poison from offerings such as apple Yakult yogurt, breakfast cereal, ondeh ondeh, chocolate stout and lychee beer sorbet. Think we're done? Nope. There's also pandan crumble, root beer float, s'mores, shoyu seaweed caramel, nutty beer, lemon basil, and white choc speculoos. Two locations, including #01-13 Sunshine Plaza, 6238-0890. Daily noon-10:30pm. From $3.50/scoop. A casual spot with waffles, milkshakes, and brownies on the menu, the cafe just celebrated its 13th year of churning glorious scoops in 2017, and explored its kooky side with blends like miso sesame brittle, orange macadamia, pear and walnut crumble, yuzu with Sapporo beer, hojicha with chestnut, and mulled wine with mixed berries. Things may switch up every now and then, but you know it'll always be there for you (especially during festive seasons) when you're craving for anything but chocolate or vanilla. Four locations, including #01-03 School of The Arts, 6509-4875. Sun-Thurs 11am-10pm, Fri-Sat 11am-10:30pm. From $3.80/scoop. 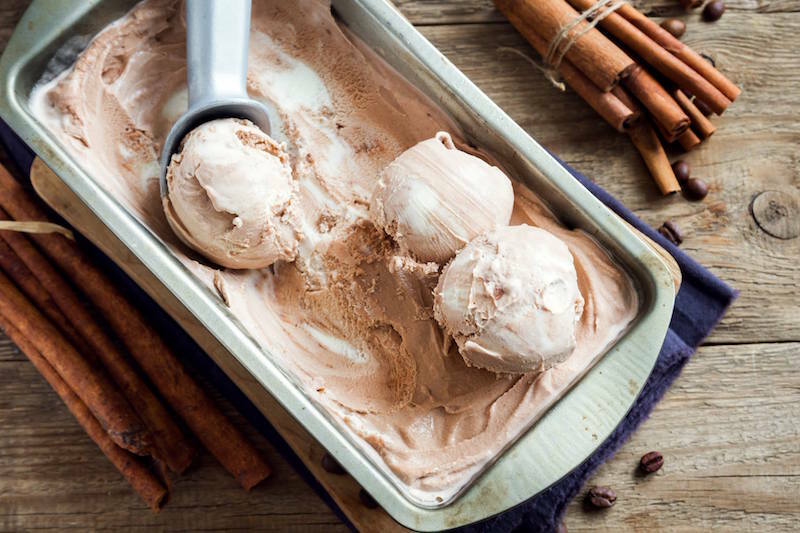 One of the forefathers of the indie, small-batch ice cream movement that paid homage to local flavours, this little gem has stood strong through the trends that came and went over the years. Still, its penchant for weird and wacky ingredients that just work keep us coming back for more. 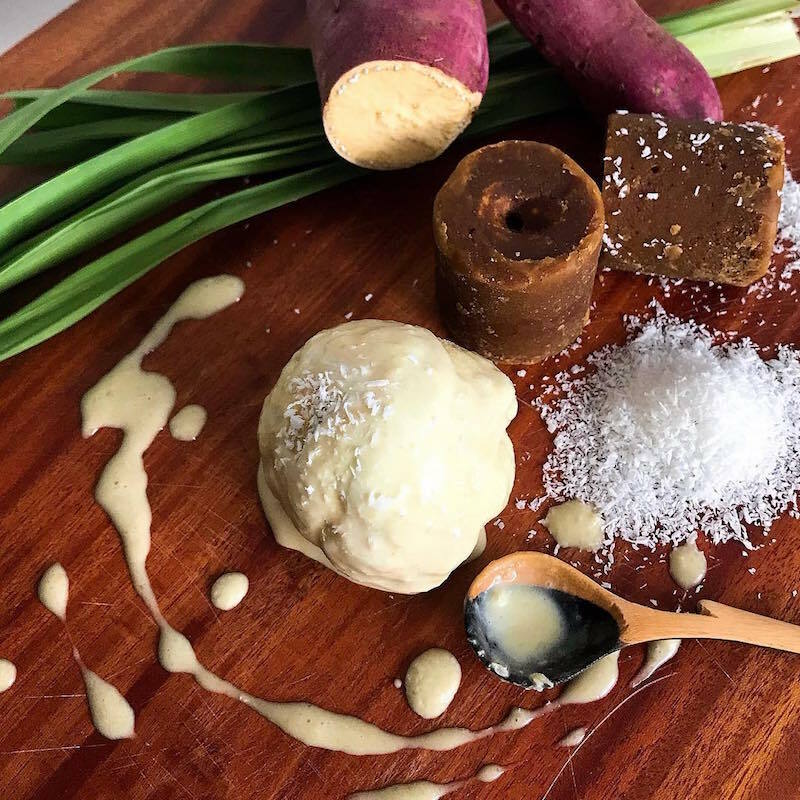 Offbeat yet sublime creations on the line-up include salted egg yolk, white chocolate nori, nasi lemak, soya ginger, chee cheong fun, longan red date, parmesan cheese and cream crackers, gingerbread, stout caramel, and "ang moh" carrot cake. Plus, no matter what size cup you get, you're always allowed to squeeze two different flavours in there. Sounds pretty perfect for the indecisive ones among us. #01-25 Shaw Leisure Gallery, 6296-5239. Mon-Thurs noon-9:30pm, Fri-Sat noon-10pm, Sun 1pm-7pm. From $4/two half scoops. 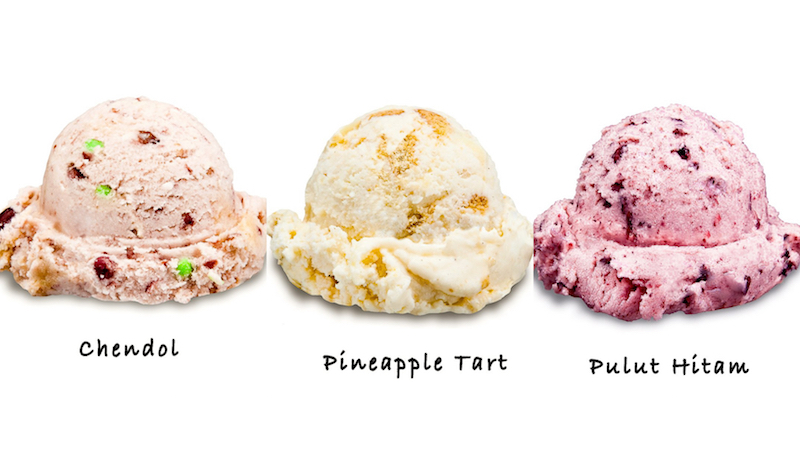 When you think local ice cream names, Udders immediately comes to mind. The ubiquitous brand constantly experiments with its hand-made creations that contain as many natural ingredients as possible - and in case you didn't know, its recipes are egg-free. Udders' series of "Asian Flavours" includes Horlick balls and chendol, while "Cosmopolitan Flavours" offers Snickers Mars honeycomb vanilla and salted speculoos. If you prefer a splash of booze in your scoop, try the cheekily-named Cereal Killer of cornflakes in milk with bourbon, or Wineberries for cranberries soaked in port. 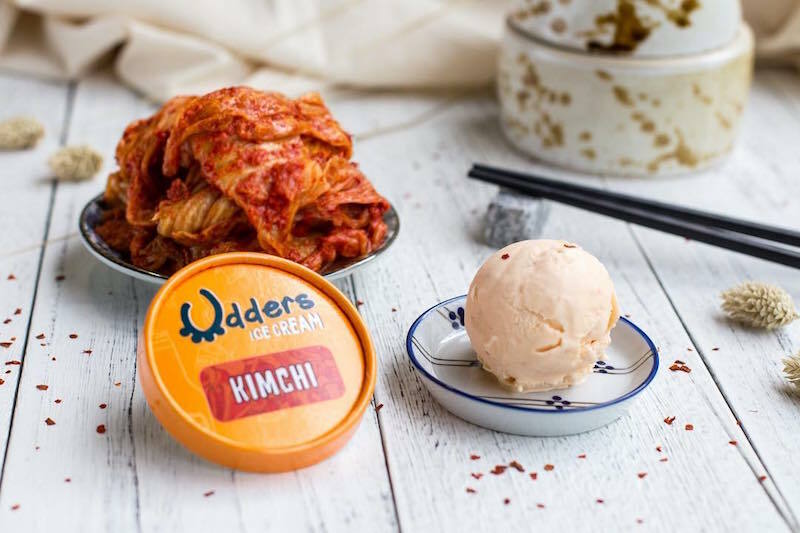 Alternatively, stay tuned to its seasonal inventions, like when it came up with kimchi ice cream as a tribute to the historic Trump-Kim summit in Singapore this year. Five locations, including 246D Upper Thomson Rd, 6452-0803. Sun-Thurs noon-1am, Fri-Sat noon-2am. From $4/scoop.